So if you are looking for that little bit more excitement and variety, the route described below takes you on a circuit by Carn Mor Dearg and Carn Mor Dearg Arete to climb Ben Nevis from the South-East. This way you'll get a real view of the mountain and a full appreciation of the sheer size of the buttresses and couloirs that dominate the North-Eastern side. 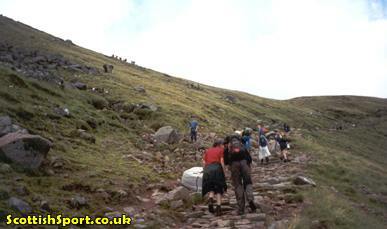 It is however, a fairly demanding route and should only be attempted by experienced and properly equipped walkers. Leaving the roadside, cross the River Nevis using the footbridge opposite the Hostel. Follow the path until it joins the path from Achintee House (GR 132721) and widens considerably to form the "motorway" up the mountain. The path zig-zags up to Half Way Lochan (Loch Meall an t-Suidhe) at GR 146724. From here the faint hearted can follow the tourist route that meanders towards the summit. From the Summit of Carn Mor Dearg, head south and west along Carn Mor Dear Arete. 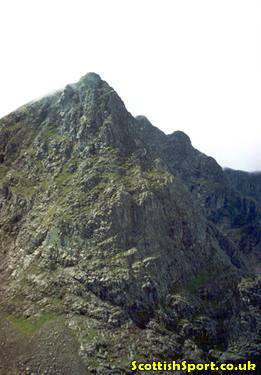 This is a magnificent ridge and although not up with to the "trouser filling" experience of Aonach Eagach, it is a moment to savour as it curves west towards the Ben. 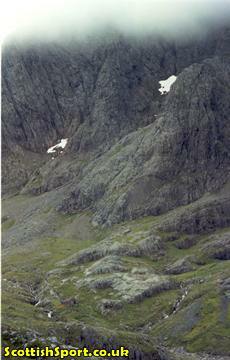 On your descent, follow the tourist path to Half Way Lochan and back to Glen Nevis Youth Hostel.